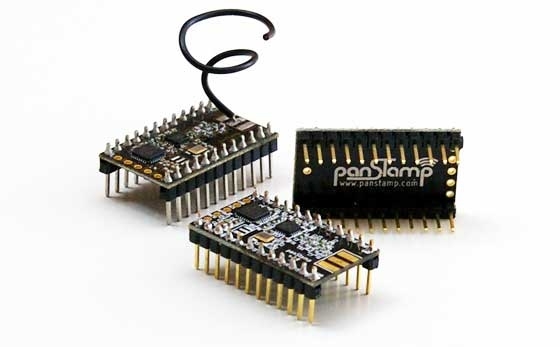 panStamps AVR are small wireless modules programmable from the Arduino IDE. Each module contains an Atmega328p MCU and a Texas Instruments CC1101 RF interface, providing the necessary connectivity and processing power to create autonomous low-power wireless motes. Everything contained into a compact DIP-24 module. Programming panStamps is a very simple task. Our open source Arduino library lets you create your own devices and wireless networks simply by adding some lines of code into your Arduino sketch. This lets you focus on what is really important: your application. All the communication-related tasks are then undertaken by the panStamp stack so that you will not have to worry about receiving or sending packets or processing wireless commands. panStamps can be used and programmed as any other Arduino platform except that panStamps provide low-power wireless connectivity as well. You can connect your preferred sensors to these wireless arduinos, design your own mother boards or buy any of the already available base boards that best fits your application. In order to guarantee connectivity and interoperability between panStamps, the open source stack implements SWAP, an open source protocol specially designed for TI CC11XX radios. The resulting stack typically takes around 7 KB of Flash and less than 1 KB of RAM.